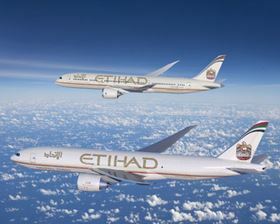 The 787-9 Dreamliner and 777 Freighter in Etihad livery. The order also included two Boeing 777 Freighters. Etihad, the national airline of the United Arab Emirates, has a total of 41 787s on order. "Our decision to expand our Dreamliner fleet is testimony to Etihad's commitment to operating one of the youngest and most fuel efficient fleets in the skies," says Etihad Airways CEO James Hogan. "It also reflects our confidence in the 787's ability to have a significant impact on our operating efficiencies and the passenger experience we can offer onboard this revolutionary aircraft." The construction of the Boeing 787 Dreamliner is 50% composite materials. Norsk Titanium AS has received from Boeing an order for AM structural titanium components.